The biggest Snowscoot competition ever will take place in "Les Mosses" in Switzerland. Three days long 150 riders from 12 countries will compete on a dual slalom, boardercross, downhill individual, and freestyle. You can suscribe on http://www.facebook.com/event.php?eid=161863680526603&ref=ts or find the inscription file hereby. From 2013-01-26 to 2013-01-28 INTERNATIONAL PYRENEES SNOWSCOOT OPEN PIAU ENGALY FRANCE The biggest Snowscoot competion of the season will take place in Piau Engaly France in the french Pyrenees. 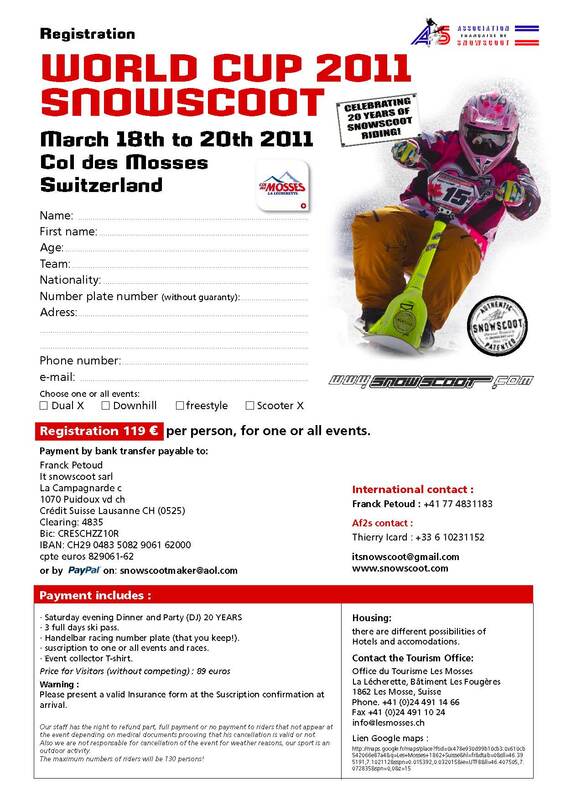 BOARDER CROSS, FREE STYLE and for the first time a FREE RIDE EVENT will be organised, The french Snowscoot Association APS will organise this outstanding event.